Believe it or not, I'm pretty lazy when it comes to cooking during the week. I'm usually eating the leftovers from the weekend's recipe shoot or by some miracle I've meal prepped for the week. Very often if there aren't leftovers, I unashamedly eat toast for dinner because I just can't be bothered. Whichever the case is, food that's already made is my dinner go-to more often than not. Now is the time of year where most students are headed back to school, if they're not already there. I remember coming home at the end of a long day of work and class with barely any energy for a real meal. I ate a lot of ramen and PB&Js. It was a dark time in my life, so please no judgement. Eating healthy and making quick meals can be easy if you just do a little planning. Sure PB&J isn't the worst meal to bring for lunch, but there are certainly healthier and more nutrient dense options! If you're looking for an easy breakfast meal prep idea, try making my delicious and filling Blueberry Oatmeal Energy Bites. Another dinner idea that isn't necessarily meal prep, but could be easy to plan for is freezing a batch of my Simple Arrabbiata Sauce and adding it to some pasta on a night where you have a little more time. In this recipe, I'm going to share with you a simple, nutritious, and filling lunch or dinner option that will keep in your bag even if you're at class all day long. If you have access to a microwave, these spring rolls can be heated up, but they're just as delicious chilled or at room temperature. In this recipe I recommend using circular rice paper sheets over rectangular or square ones. Unless you are a Chipotle employee or other form of professional burrito roller, I highly recommend sticking to circular rice papers. After struggling the first few times making these spring rolls with rectangular rice papers, I can confirm circular ones are much easier to work with. These spring rolls check off pretty much every nutritional box you need for a filling meal without sacrificing flavor. You have protein from the tofu, carbs from the rice noodles and sweet potatoes (plus a solid serving of Vitamin A! ), and healthy fats from the avocados. Hitting all these nutritional goals in one meal will ensure you stay full for the remainder of your day so you can stay focused on school or work without worrying about being hungry. Preheat your oven to 400 degrees F. Combine all the marinade ingredients into a small dish, stirring until creamy. It should have the consistency similar to mayo. Slice your tofu into about 1/2 inch rectangles, long ways. Peel your sweet potato, halve it, and cut the half you are using into 1/2 inch thick rectangles, similar to thick cut fries. Using about 1/3 of the marinade/dipping sauce, brush each slice of tofu on both sides with the sauce. Brush your sweet potato slices with the 1 tbsp of garlic paste on all sides. Place both the tofu and sweet potatoes on a lined baking sheet and set a timer for 12 minutes. Keep the remaining marinade in the fridge to stay cool. While the tofu and sweet potatoes bake, in a small pot bring 1 1/2 cups of water to a boil. Once boiling, add the rice noodles. These cook very quickly, so make sure you stir the noodles to prevent burning or sticking together. Once the noodles are cooked, strain the water and place the noodles in a bowl. You can add a tbsp of water to prevent the noodles from sticking together while the tofu and sweet potatoes finish baking. While the noodles cool, slice your avocado thinly, long ways, and finely chop your green onion. Add about 1/4 cup of water to a large, shallow plate for dipping the rice papers into. After the tofu and sweet potatoes are done baking, remove from the oven and allow to cool for 5 minutes before assembling your spring rolls. To assemble: submerge a rice paper sheet into the shallow water for about 5-10 seconds, allowing it to become softer. Remove from the water and gently place on a clean work space such as a cutting board. Place a slice of tofu about half way off of center. Add a spoonful of dipping sauce on top followed by 2 sweet potato slices, avocado, green onion, and a small handful of rice noodles. 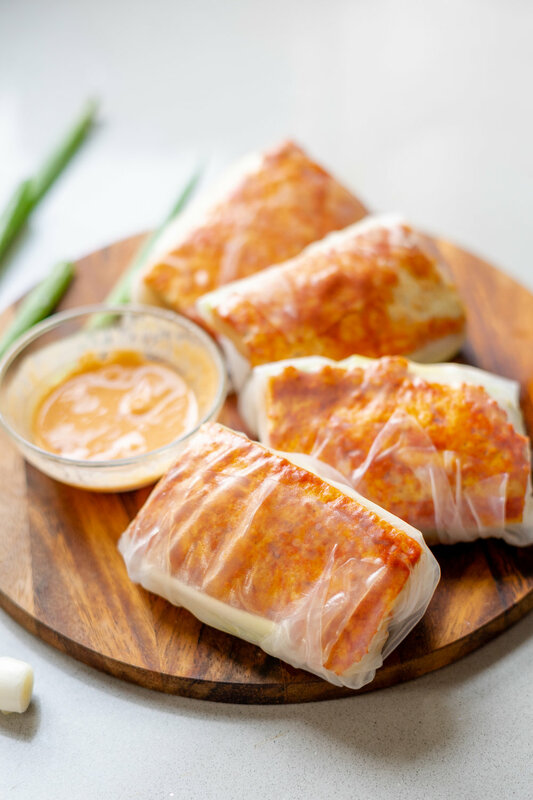 Pull the rice paper sides over the tofu and roll it up away from you, like a burrito. Repeat this process until all ingredients have been used up. If there's any remaining sauce, you can use this for dipping your spring rolls.